The Musée des Collectionneurs in Angers could be the first in an international network of collectors’ museums. Are you a major collector who wants to show off your art, but aren’t interested in bankrolling your own museum (or loaning or donating to a public one)? Now, you have a third option: The Musée des Collectionneurs, a kind of joint exhibition space for private collectors. The first such space is now taking shape in France—with heavyweight backing. Jean-Jacques Aillagon is a consultant on the Angers project. A former minister for culture, Aillagon advises the billionaire collector François Pinault and famously brought Takashi Murakami to Versailles when he was in charge of the palace outside Paris. The designers believe the innovative concept is the first of its kind, and while the exact details are still to be announced, we are told there will be no more than four collector shows a year. Compagnie de Phalsbourg hopes to deploy the concept internationally and forge a worldwide network of collectors’ museums, artnet News understands. The project in Angers includes a boutique hotel alongside the new museum. A call for cutting-edge designs was first launched last year as part of the “Imagine Angers” initiative, a public appeal for submissions geared towards transforming the city on the western edge of the Loire Valley into a cultural hub. The competition stressed that proposals should work with the city’s architectural and historical quirks and offer environmental sustainability. It generated 48 proposals for several emblematic sites owned by the city. The museum and hotel will be on the river Maine opposite Angers’ historic castle. Holl impressed the jury with his design of a geo-thermally powered museum. According to a statement from the firm, the design for the more than 5,000-square-foot museum was inspired by the historic Chateau d’Angers, which was built by King Louis IX in the 13th century on the foundation of an even older fortress from the ninth century. The museum, which neighbors the city’s biggest theater, Le Quai, will include gallery space for both permanent and temporary exhibitions, education and storage facilities, as well as an atrium for events. The design for the adjacent hotel, which is connected to the museum by a rooftop restaurant, was apparently inspired by a 14th century tapestry known as the “Apocalypse Tapestry,” which is on show across the river at the Chateau d’Angers. 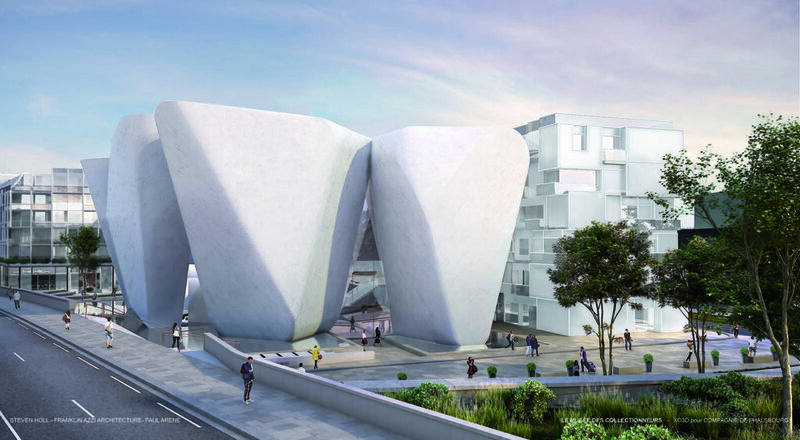 Rendering ©Steven Holl – Franklin Azzi Architecture – Paul Arene/ XO3D for Compagnie de Phalsbourg.